The stand-alone (offline) EGT is primarily a battery powered stand alone lockset utilizing a keypad for controlled access. Offline locksets require user updates and lock settings be manually updated at each opening. Auxiliary power input, remote release contacts and mechanical key bypass are standard on all models. 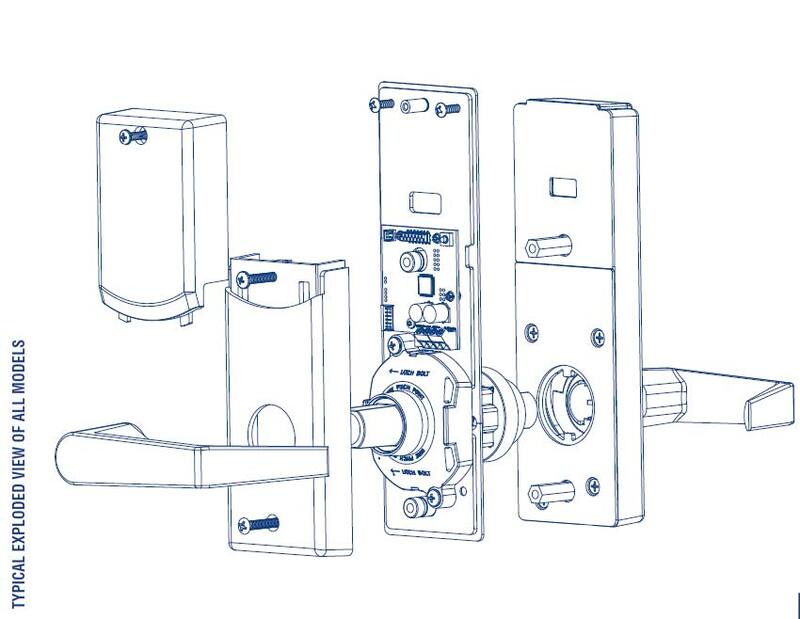 ELECTRONICALLY SELECTABLE FUNCTIONS: Re-lock Mode: With any valid credential the lock will unlock for a configurable number of seconds then re-lock. 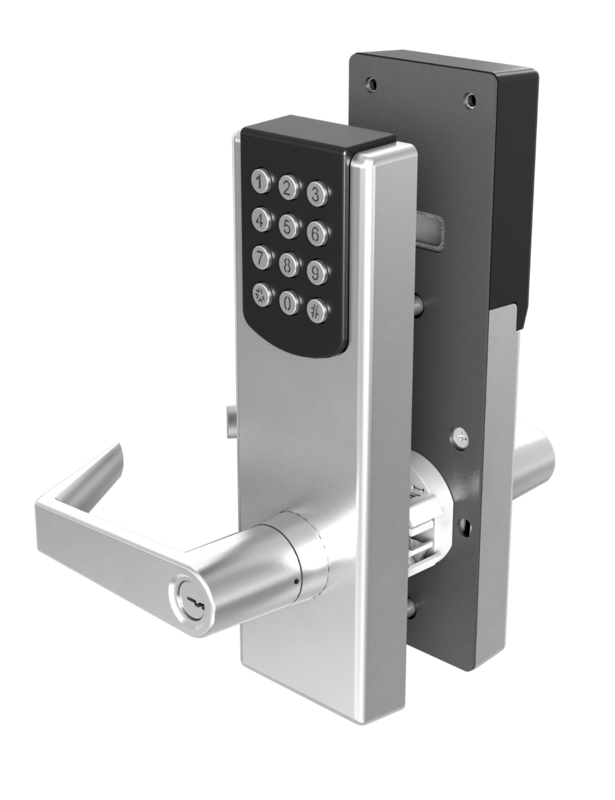 LOCKING MECHANISM: Built with an ANSI/BHMA Grade 1 chassis. 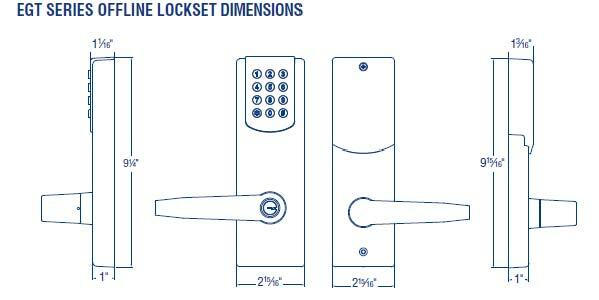 The lever positively locks/unlocks and is less confusing to users than other designs featuring a clutch. BATTERY LIFE: 130,000 cycles on a set of (4) AA alkaline batteries. PROGRAMMING: No external devices or connections required. WEATHER RESISTANCE: Full outdoor – both sides can be exposed to weather. DOOR PREP: Fits standard 160/161 door with 3 additional holes. CHASSIS: Heavy duty zinc diecast, investment cast and stainless steel mechanism. STRIKE: 4-7/8" x 1-1/4" (ASA) standard “T” or “FL” Strike optional specify when ordering. Stainless steel or wrought brass. LATCHBOLT: 9/16" throw with dead latch standard. 2-1/4" x 1-1/8" Stainless Steel or Brass front; Beveled 1/8" on 2" door. LEVERS: PHL, BSN or MIA levers are solid zinc diecast. 41˚ lever rotation. CERTIFICATIONS: U.L./U.L.C. 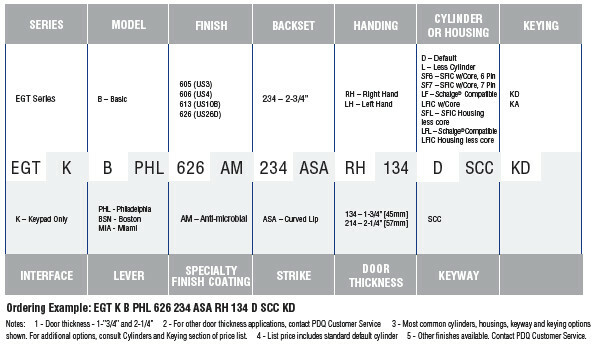 Listed for “A” label (3 hour and less) single swing doors (4'0" x 8'0"). U.L. 10C/UBC 7-2 (1997) Positive Pressure Rated. U.L. 10B Neutral Pressure Rated.